Solid sushi offerings from the confines of a Laguna Hills strip mall. 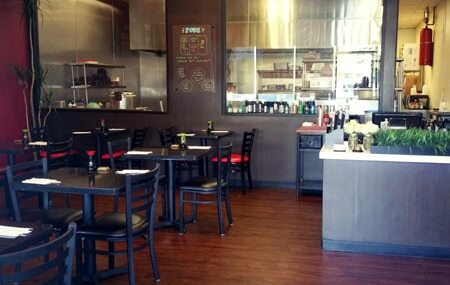 : This cozy Laguna Hills spot perpetuates the notion that some of the most enjoyable expressions of sushi in Orange County can be found in nondescript shopping centers. Owner/executive chef Jung Kurniawan doesn’t reinvent the proverbial wheel with his sushi inventions, but it's not necessary. Sushi and sashimi bites of tuna, shrimp and albacore are clean and flavorful, and his array of specialty rolls like baked salmon-topped California roll and piquant spicy tuna and jalapeño roll satisfies. The venue’s list of build-your-own poke bowls and teriyaki plates is also a nice option to consider if you’re not in the mood for sushi.